Who says you need a big house with an expansive yard to achieve the American Dream these days? 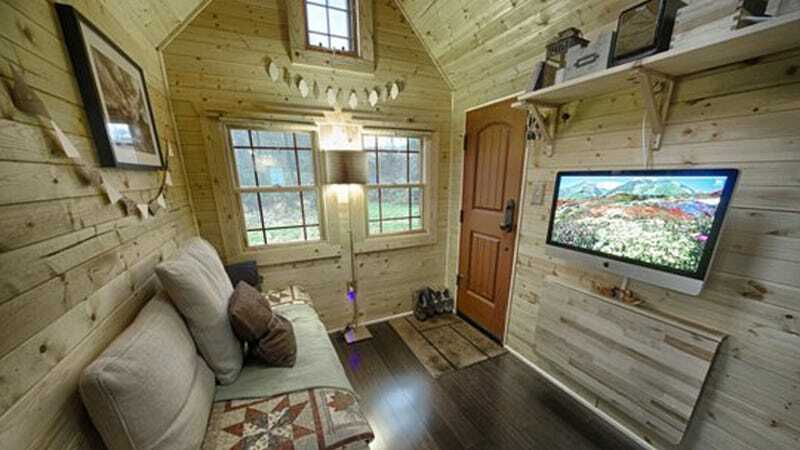 One Washington State resident has found her perfect home in the 140 square feet of living space she's built herself. Located in Snohomish, WA, Apartment Therapy reader Melissa submitted her teensy abode as part of the site's Small Cool 2013 contest. "We [she and her husband] built it with our own hands," Melissa told AT. "We designed the house with us in mind and it works perfectly with our lives... it's home!" It's a basic bungalow-style house with a elevated sleeping loft over the kitchen. The wood slat construction gives the home a rustic feel, which is nicely countered by the super-sized flat screen in the living room. Check out more shots of this miniscule mansion and the rest of the SC2013 entries over at Apartment Therapy.